...basking under my yellow sky...: Nelson Mandela Day! 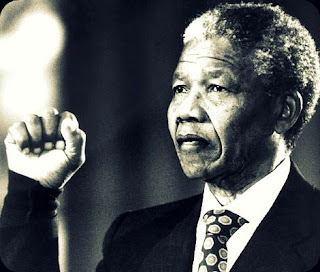 Nelson Mandela explained in his autobiography, "When I was among the crowds I raised my right fist and felt a roar. I hadn't been able to do this for 27 years and it was like a shock of happiness." This gesture of freedom marked the liberation of a man who had spent 27 years, six months and five days in prison for believing in social justice. That gesture of liberation, a historic moment for South Africa, was echoed around the world through television images. This simple act of feeling and being able to express freedom has perhaps written its own page in history. Nelson Mandela Day reflects this moment of liberation in its logo, which reminds us of the key words which have marked Mandela's life. Act, Lead, Learn, Listen, Speak, Unite and Remember; these words call for social equality and for each one of us to adopt these values and help to better the world around us.